THQ confirms that 240 non-studio jobs are being eliminated, while CEO Brian Farrell will take a single-year pay cut of 50 percent. 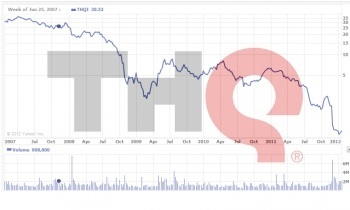 Details about the heavy layoffs hitting THQ, first reported in late January, have now come to light through an 8-K filing made to the U.S. Securities and Exchange Commission. As expected, the company's internal studios will be untouched, but the cuts are still deep, affecting up to 240 "selling, general and administrative personnel worldwide." But cutting those people loose is going to bring some special pain of its own, to the tune of about $11 million in special charges. "These charges will primarily be severance costs for affected employees, which are estimated at approximately $8.0 million, potential charges related to other fixed assets that may be abandoned, which are estimated to be up to $2.5 million, and contract terminations, which are estimated at approximately $0.5 million," the company reported [PDF format]. "Of the total charges, $8.5 million are expected to be cash expenditures. Of the cash expenditures, approximately $4.5 million are expected to be paid in the quarter ending March 31, 2012; approximately $2.5 million are expected to be paid in the quarter ending June 30, 2012; with the remainder to be paid thereafter." THQ President and CEO Brian Farrell is also facing cuts, not to his job but to his salary, which is being reduced by 50 percent for one year, from $718,500 to $359,250. His lump sum compensation for being terminated without cause was also reduced, "from three (3) times the annual rate of the highest bonus amounts Mr. Farrell received during any prior fiscal year to one (1) times such bonus amount." Not that he'll be suffering too much; according to Forbes, Farrell's 2010 salary was $677,000 but his "total compensation," including non-equity incentive plan compensation and option awards, was nearly $2.5 million.